Point32 wants to rehab the 1931 building and add 60 condos units to the site at the corner of Bellevue Avenue East and East Roy Street. 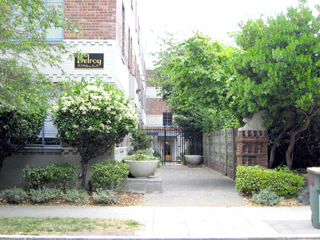 In the mid-1980s Chris Rogers lived in the BelRoy apartments on Capitol Hill, an art deco building at 703 Bellevue Ave. E. that has also been home to a number of area architects. Rogers fondly recalls the almost floor-to-ceiling angled bay steel-framed windows of the 1931 building and its period door hardware, bathroom fixtures and colored tile. “It was a great place and I really chose it because of the design of the building and its urban location,” he said. Now Rogers' Seattle-based company Point32 intends to rehabilitate the 52-unit structure. It was designed by Bain and Pries, a Seattle firm that was headed by William Bain, a founder of the NBBJ architectural firm, and Lionel Pries, a Seattle designer and University of Washington educator. But there is more than just a rehab. Point32 has filed plans with the city of Seattle to add condo buildings with about 60 units to the site at the corner of Bellevue Avenue East and East Roy Street. Plans call for two three-story structures, with one of those buildings having a six-story wing. Most of the condos will be 600 to 1,000 square feet, and those in the wing will be two levels. The developer hasn't decided whether the BelRoy will be converted to condos, but said if it is the units should be on the affordable side given that they are small, averaging about 550 square feet. No contractor has been selected for the complex, and Rogers said it's too early to seek financing. He said that if all goes well, construction could begin by late summer or early fall of next year. The footprint of the new structures will be narrow, like the BelRoy's, and the units will be accessed via multiple stairwells that eliminate the need for interior corridors, Rogers said. This arrangement will allow light and ventilation in the units, reducing energy costs and creating a healthier environment, he said. “I do think natural ventilation and natural light enhance one's living experience and I do think a lot of buyers, given the increasing energy costs that we (will) see, are looking for more efficient ways to live their lives,” said Rogers. The project will have courtyard gardens like those in older apartment buildings. Residents will walk through the gardens to reach the stairwells. About 60 stalls of underground parking will be created, with access via the old BelRoy garage entrance. This configuration will allow elimination of four curb-cuts on Bellevue Avenue East and allow the addition of landscaping there, Rogers said. The developer also plans a community P-patch and an on-site car-share program. It is proposing to work with the state Department of Transportation to add more vegetation on a hillside below the site that was created when Interstate 5 was constructed. Rogers said the area is an “attractive nuisance” with homeless encampments and garbage. Point32 hopes to come up with a design in which the mechanical systems can be shared by the BelRoy and the new construction, said Rogers, noting that the older building's electrical and plumbing systems need repairs. Point32 needs a contract rezone to build the six-story wing because the site is only zoned for three stories. Rogers said it is needed to make the project financially feasible. He said heights in the neighborhood range from low-rise to six, eight and nine stories across from Point32's planned project. Five older homes on the site will be removed to make way for the complex. The BelRoy, a wood-frame building with a brick facade, is not a city of Seattle landmark. Rogers said Point32 plans to nominate it for landmark status. Lesley Bain, with the project architect Weinstein A/U, said the BelRoy is “a really cool building” that has been home to a number of architects. New construction on the site will take its architectural cues from the BelRoy, but not mimic it, she said. “Projects where you can keep old and new are just so much better than when you slash and burn a site and just build a big thing on it,” said Bain, whose great uncle was William Bain. Prior to forming Point32, Rogers was project manager for the Seattle Art Museum's Olympic Sculpture Park. Point32 is partnering with the Bullitt Foundation to develop a living building on Capitol Hill. Previously Rogers was a project manager with The Trust for Public Land, based in San Francisco. The Seattle native said he has a bachelor's degree in art history from Bowdoin College and a master's in forestry from Yale University. Point32's other managing partner is Chris Faul. He previously worked at Martin Smith Development Corp. where he was involved in historic rehabilitation in Pioneer Square. Faul, a structural engineer by training, also worked in Mexico on a large resort development. Point32's two partners are Matt Kellogg and Jim Dow. Lynn Porter can be reached by email or by phone at (206) 622-8272.